Garage organizing is among our favorite projects. Sure we get dirty, but the before and after results are so impressive! 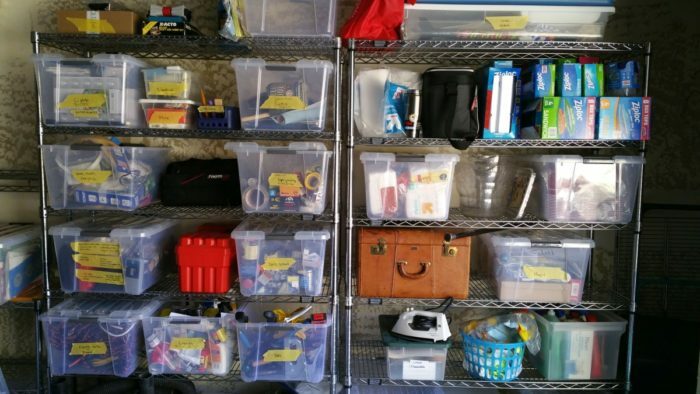 Garage organizing is often a great place to start in whole house organizing. The garage typically holds things that are not used frequently, and the storage opportunities may relieve pressure on other areas of the house. This garage project happened on the arrival end of a move. Antiques, sporting equipment, tools, seasonal items and evidence of several hobbies were hauled out of one house and dropped in another. It was probably the last project the new homeowner would get to! Two days, 12 shelves and three organizers later, this garage is a rolling, active environment a lot like going into a retail store and picking out what you like. We used heavy duty Trinity Ecostorage Wire Shelves with wheels. First we consult with you to see what your goals are, then we make a bigger mess and gently sift it into bins and boxes and label it all. Then we give you the grand tour. Nothing is discarded without your expressed approval. Other garage organizing projects call for simple solutions. Our storage solutions page shows a simple rolling cart with stacked bins. This is a mobile and vertical answer to small garage problems. You get the peace, serenity and joy of a spa treatment for your garage. Check out some of our before and after projects here. Call Janet today for a consultation and estimate for your project.